Last weekend some of our friends came over all the way from Colombus.I knew how they all loved fish and so prepared this chilly fish and shrimp fried rice to go along with it.The recipe is from Mrs.K.M Mathew’s Malayala Pachakam. I’ve used King fish here,but you can use any fish of your choice. Prepare a marinate by mixing all these together. Apply the marinate on the fish pieces and allow it to stand for 2 hrs preferrably in a refrigerator.Then deep fry it in Peanut oil. ( I didn’t have peanut oil,and so i used vegetable oil itself). Heat little oil in another pan and fry the red chillies till brown.Remove them from pan,and pound them to a coarse powder. Keep it aside.In the remaining oil,add onion,ginger and garlic and saute them until onion turn translucent.Now add chilly powder,chopped tomato and ketchup and saute them till oil starts to seperate.Mix fish broth,vineger,corn flour, ajinomotto and salt together and pour the mixture into the sauteed masala.Allow it to boil for a while,and when the gravy starts to thicken throw in capsicum and celery.Simmer for 2-3 minutes.Now add the reserved red chilly powder ,and mix it well. Arrange the fish pieces neatly in a serving powl.Pour the prepared sauce over it.Garnish with spring onion greens and serve hot. This entry was posted on September 26, 2006 at 7:14 pm	and is filed under Chinese Dishes, Seafood. You can follow any responses to this entry through the RSS 2.0 feed. You can leave a response, or trackback from your own site. Nice recipe for chilli fish Anita ! Would this make a good accompaniment for chinese fried rice ? Loove fried rice!! Chilli Fish looks perfect!! Good pics!! Thanks Annita!! Many thanks Asha.And I’ve tried your Masala Baingan.It was soo good and i’ll be posting the photos soon..
Good recipe…… but how do you make the fried rice? Like Chinese fried rice? Do you have to saute the shrimps before adding it to the rice? Is it ok to use cleaned, frozen shrimps for this? Yes..Jyotsna..I prepared it like Chineese fried rice only..As you said,saute onion first ,then add cooked shrimps , saute it for a while,then veggies ,sauces and finally the rice.I’ve used frozen cooked shrimp for this.Hope this helps.. Sounds like a chinese dish. I have never tried fish with fried rice. 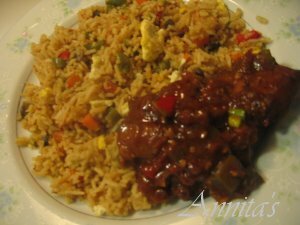 This chilli fish seems to be a great combo for fried rice. Yes RP..It goes well with fried rice..Do try this combo sometime.. Many many thanks Sarah.I’m also really happy to see your comment in my blog.Pls let me know whether you’ve liked it or not. Delicious Recipe and tantalising Pictures. Last week we went out for fishing and we caught some nice king fishes. See My Fishing. I tried your fish pickle and chilly fish recipe. It came out great. Your recipe is highly recommeded. Really happy to knew that it turned out well for you Jasu.And many thanks for letting me know about it. Did you happen to buy the book when you visited India? Where do you typically find Mrs.K.M. Mathew’s cookbooks back home? Thanks. Yeah Rajalekshmy.I got it from Kerala only.I don’t remember the exact place from wher i bought it.But I think you can get it in any book stores. chili fish is so good. thanks. i normally orderthis when i go indo chinese.does the king fish turn hard in the dish later? No Shaheen,it won’t turn hard.It actually turns soft,when the hot gravy is poured over it. We were the lucky guests who she made this for. :) We all loved it. Thanks Annoose. Now aunty is a fan of your website too. Are you getting this deep brown colour only by using 3 tsp. soya sauce. (when ever i tried i get only very light brown colour. i.e not attractive). I just followed the recipe,Suni.I din’t add anything other than that..the color may be bcoz of my chilli powder only. And many thanks for letting me know how it turned out for u..
it looks so good.i will try this and let you know the outcome.by the way can we make chilly chicken by just replacing fish with chicken? I had tried this recipe of yours it turned out really good.. thank u for such a good recipe..
Sign: gfndc Hello!!! wgeku and 9079xstsfthcgt and 8060 : Sorry, what did you mean?? A?? 2. We made the fish broth by boiling a couple of fish pieces in water and salt, and then mincing the boiled pieces into bits with a spoon. I don’t know if this step is necessary since you were successful despite skipping this step. We’re planning to try the same recipe with shrimp instead of fish, and will post our results here. Not sure whether u remember me… I was there with u in CUSAT(CS). Hope ur family is doing great! Went through the recipe… Have a doubt… For the marination, i have seen people adding conflour, maida and soya sauce… Do u think this would give a new look to the recipe? Hello, this is really a actually fascinating Internet weblog and ive loved reading various in the content articles and posts contained upon the site, maintain the good operate and hope to examine a whole lot more thrilling articles or blog posts within the time to arrive. I’ve used this recipe at least 4 times. It’s a keeper and we do not have it with fried rice but I am going to try that next time. We usually just have basmati (and I know jasmine would be better but dh loves basmati!). Thanks so much. I am going to check out other recipes as well. Can always use new ideas! From one of my friends I came to know about your blog. I tried your chilli fish recipe. It came well. 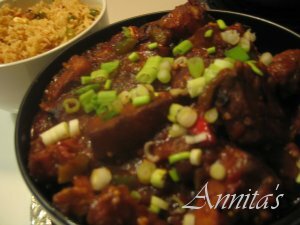 It is a very tastey recipe, suits with plain rice too….I am planning to try this recipe with fried rice.Thank you Anitha for the recipe. am pooja instead of viniger can we use lemmon? and cerely chopped if i cudnt get cn i use cerely powder?